The Enterprise appears to be forming its own rudimentary intelligence that is centered on a holodeck recreation of the Orient Express. 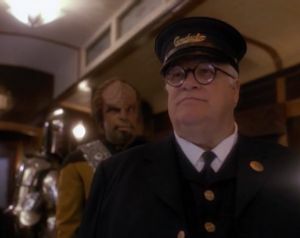 The Conductor is the Big Lebowski. Emergence is a fascinating philosophical and scientific subject, and I congratulate the writers for attempting to explain it to television audiences in the guise of science-fiction. However, like most high-level topics covered in Star Trek, this one is mired in complexity and controversy that makes it difficult to distill. What Data describes is "strong emergence" (as opposed to "weak emergence") which is the notion that something can emerge from a complex system that is irreduceable. Describing consciousness this way opens up another can of worms, as the idea of consciousness as a strong emergent property--often called dualism--is even more controversial and hotly debated by people who know this stuff better than I. Having disclaimed all that, though, the underlying concept of this episode--that the ship develops an emergent consciousness--is actually very similar to the idea that the Internet is capable of developing an emergent consciousness, which may not be completely insane. Sufficed to say, it's worth reading up on if you're interested. The last bit of exposition, right before the life-form takes off, is badly delivered by everyone, as though the actors are reading their lines for the first time off of blurry teleprompters. When the program ends on the holodeck, why are Worf, Data, and Troi still holding champagne glasses? We start with Picard explaining to Data that Prospero is performing one last bit of magic before he becomes a relic, and in a way, that is what the creators of the show are trying to do here. This episode has very bold aspirations, but it still suffers from a lot of the same problems that have been plaguing the final season of TNG. The idea of emergent, artificial intelligence has already been covered, in "The Quality of Life," and the trippy, surrealist symbolism that goes on in the holodeck is done better in Data's dreams in "Phantasms." Even the life-form appearing on the Enterprise only to fly off into space, benevolent because we believe it learned only good things from humanity, is a retread of "The Child." It's ironic, because the writers are striving to deliver something new and unique--"the ultimate holodeck show," as Brannon Braga put it--but they are really just showing us that they are running dangerously low on magic. The strange nodes that "emerge" throughout the ship remind me of the bio-neural gel packs on the Voyager.